Thanks for trying. Dsyncronize has been a reliable program and the developer has been fairly active over the years. I hope he gets back to you. Latest version of DSynchronize (2.30.9) fails to run on my system (Windows 8.1 x64)- it opens and exits almost immediately. This never happened with any version prior to 2.30.9. I contacted the developer but haven't got any response so far. If he had responded I would have provided him with the dump files. I used Dsynchroinze and It was great and all... but I had to sync a drive but it deleted everything in the desination.. does anyone happen to know any way to recover the deleted files? Correction, it only happens when I run it under Sandboxie. It doesn't save settings for me. Thus I can't use multiple profiles. Extremely fast synchronization. Because of this, you need to be careful with this one. Preview should always be checked and the results reviewed before a real run to make sure it behaves as intended. Not using preview may mean lost data in nearly the blink-of-an-eye. Otherwise, this is a great utility, especially useful for synching non-critical data. Unfortunately "save on exit" only helps if you remember to check "Preview mode" before you exit. I want to ensure I always Preview and look over proposed changes. Then I uncheck Preview and do the actual sync . and give or deny permissions as it progresses. If you exit then, and forget to check Preview it will not be selected next time. Some questions --- How can I set Dsynchronize to always open in "Preview mode"
How do I use the Backup changes feature. 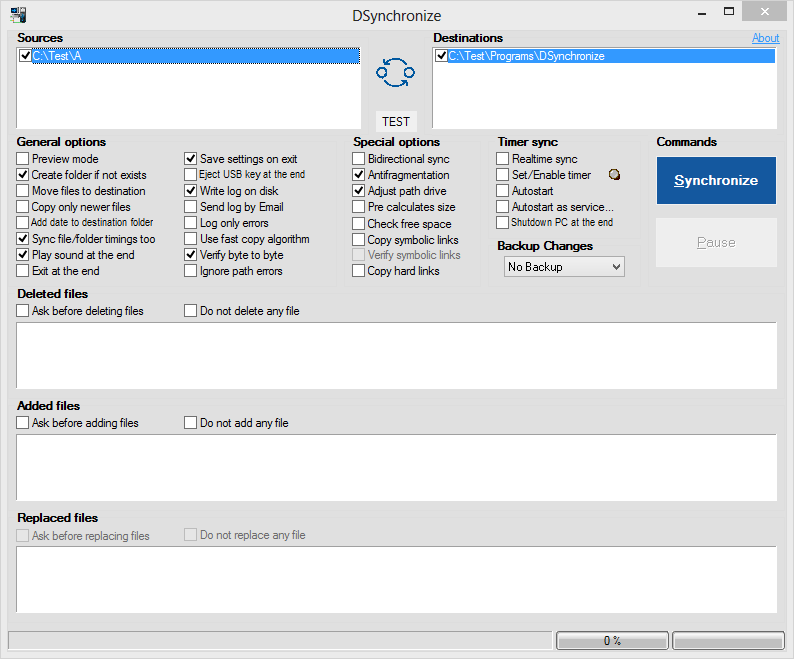 Dsynchronize is one of the most complete and straightforward solutions for file synchronization for windows that I've found. Do pay attention to the "do not delete files" option and make sure it's checked if you need it. And I recommend testing synchronization between two newly created folders with no important files contained within before risking your important data. It's standard procedure for me, because you should never take for granted you know what any software will do. Well, there may be issues with this program but it is BY FAR the very best synchronization and/or backup program I've used. There's only one tiny thing I dislike about it: When looking in the log file it does say "OK" under the summary in the beginning even if a file has been marked "FAIL" and not been copied. @Hugh H. : Why did not run it in test mode first.. did you not see the test mode check box, did you not see the DO NOT DELETE checkbox.. are you sure it's not just your "stupidest "default" behavior" (aka being a click happy end user) that caused/is the issue ? I'd have to say I love this program, although I do wish it would support shadow copying and per source+dest scheduling (I don't need or want everything to have to be real time, when I really only want 1 thing to be real time). But other then that, it runs GREAT. When you "sychronize" with this software, the FIRST thing it does is DELETE every file in the destination path that isn't in the source path!!! And it does it in a flash! It does not default to leaving your files alone! It defaults to kill. This has to rate as the stupidest "default" behavior in the universe. Make sure you run a system sync all the way through before enabling "real time" sync. Otherwise, I don't know what the issue is. In the limited tests I've done with this feature, its worked fine. I recommend contacting the author (click the "Website" link at the top of the page). I found this program useful in every case i faced but it doesn't function when you run it as a service. can you tell me your opinion about that.??? It doesn't allow you, by default, to have different synchronization settings (2-way or 1-way, etc.) for each sync pair, BUT you can run multiple copies of Dsynchronizer from seperate folders, each doing seperate jobs simultaneously, which totally solves that problem for me. I just create a group of shortcuts, one for each synchronization job, each leading to the dsynchronizer.exe in the specific dsynchronizer folder. If you plan on running more than one, I don't recommend running it as a system service. I had some sort of problem with that. Addendum to my previous note: been using the program regularly and often for about 6 months now on multiple computers and multiple configurations. To this point, there is NO OTHER sync program for my purposes. Some requests: An "rsync" style sync method that only transfers *changed* data; resending an entire 1 gig file when only a few bits have changed is time-consuming and wasteful. Also FTP capabilities would be nice. Great utility but the filter does not work in service mode. I'd agree with Webfork ... not the most user friendly but does the job. The ability to specify individual files as well as folder level sync is the differentiator. I use this forend of day back-up to a portable HDD ... it's a great little tool, is portable, and it's free! Certainly doesn't win any beauty contests but functionally perfect... almost. I only have one tiny gripe with this program. If your source directory is C:\folderA and your destination is D:\backup, it will put folderA contents in D:\backup not D:\backup\folderA. Joe, it displays UTF filenames as gibberish in the source and destination panels but if you try to synchronize you'll see that it both UTF folder and filenames sync properly. The only thing I don't like is it cannot work on unicode file name. Although not the most user-friendly sync program available, I've tested it for two months now and found it to be excellent for portable syncronization. The MSVBVM60.DLL is bundled in Windows 2000/XP/2003, so isn't necessary to place the dll in the same folder. actually all you have to do is place the dll in the same folder as the application. So I'd say it is portable. The executable depends on MSVBVM60.DLL - MS Visual Basic VM, so isn't truly portable.